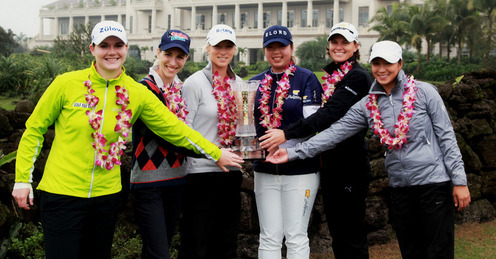 From left: Caroline Masson, Diana Luna, Melissa Reid, Shanshan Feng, Lee-Anne Pace and Frances Bondad. Ladies European Tour players gave a resounding seal of approval to Mission Hills Haikou during their first visit for the inaugural World Ladies Championship from March 2-4. Australian Frances Bondad, who won the 2011 Sanya Ladies Open in Hainan Province in October, said that the resort, which boasts 10 courses set amid a volcanic tropical landscape, was ‘a golfer’s paradise’ while Germany’s Caroline Masson said the venue was ‘pretty awesome’. Chinese number one Shanshan Feng, ranked 12th in the world, played at the venue two years ago in the Mission Hills Star Trophy 2010 when she was grouped with the American actor Christian Slater and she commented: "It’s fantastic." With two top ten finishes from two starts on the LPGA Tour this season, having tied for fifth at the Honda Thailand and shared second at last week’s HSBC Women’s Championship in Singapore, she is an obvious favourite and looking forward to the team aspect of the event. The tournament gets under way from Friday with a ‘three-in-one’ concept. Individual professional and amateur stroke play events will take place over 54 holes at the same time as a team stroke play competition. There are 19 teams, including two pairs from China and Feng is teamed with Liying Ye, runner-up to Annika Sorenstam at the 2008 Suzhou Taihu Ladies Open. Feng plays on the American, Japanese and China LPGA Tours, but rents a home in Orlando, Florida. With all of her global experience, she considered the Vintage Course a world-class test of skill for golfers at the elite level. ‘I think here we are playing long and the greens are really tough. I think maybe this is harder,’ Feng said. Located in Haikou, which is Hainan Island’s capital city, all 10 golf courses at Mission Hills Haikou are strewn with black lava rocks. Standing on the volcanic golf courses, you can view a horizon of lychee trees and serpentine lava walls. The par-72 (38-34) Vintage Course, designed by Brian Curley, has been set up at 6460 yards for the tournament and is playing long on account of the recent rainfall. In addition to the leading professional competitors, there are also eight amateurs in the field of 108 competitors including world number one Lydia Ko, who will play for a separate amateur title. New Zealander Ko made headlines last month when she became one of the youngest ever players to win a professional tournament at the New South Wales Open in Australia aged 14. After touching the impressive crystal trophy during a photo-shoot on Wednesday, all of the star players will be keen to get their hands on the prize again.